"A poignant tale, told in a charmingly human voice, of three idealist young men attempting to resolve their different views of Taiwan. The author asks how the world can continue to justify the constant pressure--economic, military, and political--on free and democratic Taiwan from a hostile, authoritarian China. This is beautifully written." 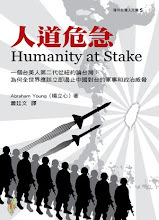 "If you have ever tried to intelligently discuss the complexities of Taiwan-China-US relations and found yourself in an awkward moment due to personal sensitivities or lack of expertise, then Humanity At Stake is a must-read. Abe Young readily crafts an honest, amusing and contemplative exploration of the issues behind the current international state of affairs regarding Taiwan, all revolving around an everyday conversational encounter. He has a gift for putting into words (and footnotes) the thoughts that most Taiwanese Americans wish to articulate. This is a wonderful starting point to introduce the facts and issues and to initiate further dialogue in an interesting and entertaining way." This insightful young writer has captured in Humanity At Stake so many of the dilemmas that Taiwan has faced in its modern history. All people concerned for human rights and Taiwan, or the American public that wants to understand the basic issues of Taiwan-China cross-strait relations should read this enjoyable book. An inspiring read! "In the context of a casual conversation between co-workers, Abe Young presents a straightforward and measured discussion of China's relationship with Taiwan and Taiwan's impressive democratic growth. Informative without being didactic, Humanity at Stake is a must-read for anyone concerned about peace and democracy in Asia." "Taiwanese across the globe face challenges when it comes to explaining the intricacies of what it means to be Taiwanese. This book clearly & concisely defines the background, issues and struggles Taiwanese encounter on this path. Now is the time for the younger Taiwanese generation to speak out, and this book does precisely that. Regardless of how familiar one is with Taiwan, an insightful read."